Just as pictured. Slightly too big in the Banda and the clasp was hard to figure out at first. Will have to take to a jeweler for the adjustment. Otherwise, my mom loved it! 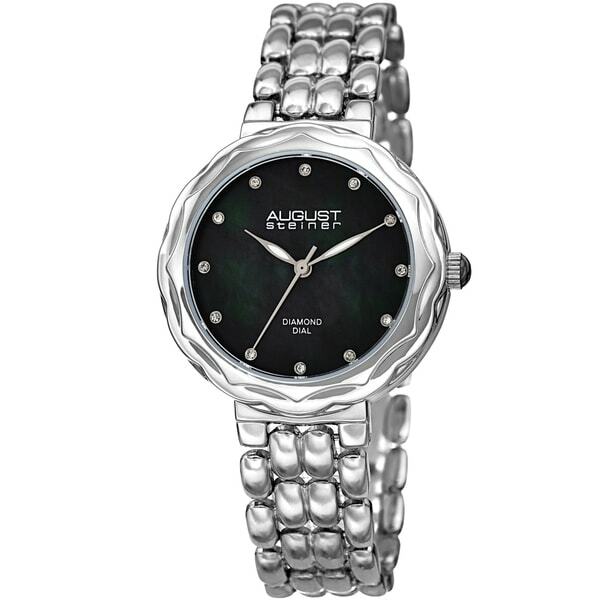 Wear this watch to add a touch of class and elegance to your outfit. The bracelet features genuine diamond markers at each hour position on a soft mother of pearl dial. The sturdy link bracelet will sit comfortably on your wrist. Just a beautiful watch. The black mother of pearl face is unique. It is easy to read the time and the quality is obvious. So glad that I decided to order this. I like my Ladies Watch. The black face with silver-framed white hands on silver watch is quite attractive, but it is not as "substantial" as I thought it would be. It is somewhat flimsy, which makes it light and I find quite nice. If it sounds like I am being contradictory. . . let me be clear. Initially, I was disappointed when I received the watch at the feel of it, but I found it to be very attractive so I kept it. And now after wearing it I am completely happy with it - it looks very attractive, the face is super-easy to read, and it has become my everyday watch. I would recommend it. I like the watch. I was supposed to get a bangle bracelet, never got it. Why? I bought this watch as a gift, so I can't give a true review for better or worse. However, the package was delivered rather quickly and it appeared to be exactly what I ordered. One small detail that I will mention... is that the watch seemed a bit lighter in weight and more flimsy than what I was expecting. Maybe I just am used to men's watches. They are much bigger and heavier. I am not implying anything about the craftsmanship of this time piece. We will find out the answer to that in time. All in all, I am very pleased with my purchase. Had purchased a watch from Overstock several years ago and my wife wanted a change. She finally picked this one out and has been completely satisfied with it. Can't beat Overstock as their prices are below retail value otherwise. This watch is very pretty. It has a great style and bling to the facet of it. It fits properly and is easy to apply and remove. With purchase again. Love the easy closure of the wristband!